If you could create a list of the top-10 stamping-related problems in your press shop, die damage at coil change likely scores high on the list for most shops running progressive dies. There are many causes of die damage at coil change; here are three. Short feeds (or misfeeds) cause most of the die damage that occurs in press shops. Care must be taken to ensure that the strip starts correctly into the die. Improper positioning of the leading end of the strip will do more damage to the die in the first 10 strokes of the press than the next 10,000 strokes. To avoid short feeds, minimize the use of round stock lifters that are notched on one side for threading the strip through. While inexpensive and easy to install, they provide less support for the coil strip as compared to a rail-lifter system. The need to hand-feed the stock through each stock lifter presents an opportunity to make a mistake when starting a new strip. A good rail-lifter system design will reduce setup time and allow higher press speeds because feed problems are minimized. Also, ensure that the lifter systems (or individual stock lifter, if used) are all at the same height when the die is open. This ensures that the strip is supported in a level plane as it feeds forward. Be sure that the strip does not sag between any of the lifters. 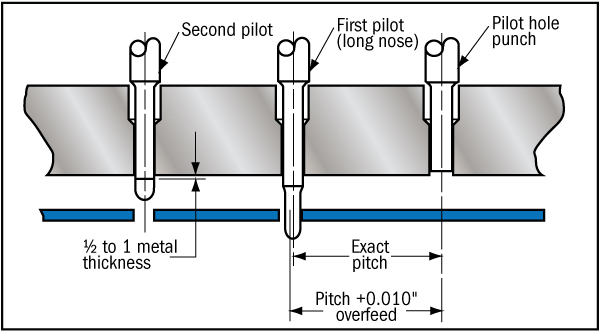 If not corrected, the strip will be pulled out of its correct die position. Again, rail systems generally provide better support and usually perform better than spring lift pins or round lifters that are notched on one side. Extended guide rails with large lead-in angles assist press operators when starting the strip. 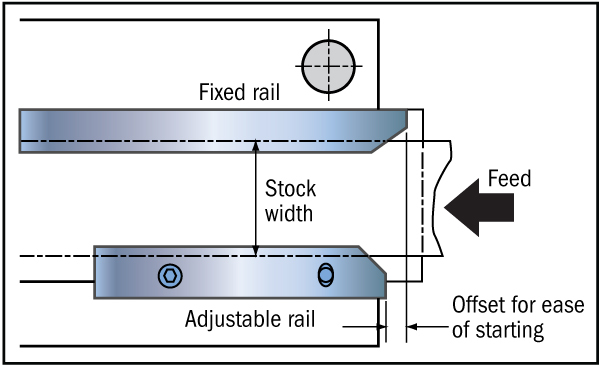 Make one of the stock rails adjustable to compensate for any variation in strip width (Fig. 1). The first-hit position of the coil strip’s lead edge is critical for the first press stroke, to ensure that piercing punches do not cut partial holes in the lead edge. Use a positive stop, pitch notch or spring pin, rather than a sight stop. Unbalanced forming or cutting can result when starting the lead edge of the strip, which can tilt forming pads and stripper plates. This can be particularly problematic when stamping thick materials. Ensure that forming and cutting stations have heels to absorb side thrusts when stamping thick materials (Fig. 2). It also is important to balance the strippers and pressure pads with balance blocks to keep the pads and strippers from tipping as the strip stock feeds step-by-step through the die. Starting a strip out of position (off-progression) will likely cause die damage. Many parts require the edge of the blank to flow inward during flanging, forming or drawing operations. This requires blank material to move sides or flex vertically, or both, during the die operation. Here, use a flexible part carrier to allow flexing and movement of the blank without pulling adjacent parts out of position.